ARLINGTON, Va. — Benjamin and Madi are best friends. They spent part of their Friday on the ice at the rink where the Washington Capitals skate. We met them last year at the Dreams for Kids event. That's a non-profit that provides opportunities for kids with physical, developmental and intellectual disabilities. Benjamin deemed Friday's event fun. Madi said she enjoys "watching the kids get excited year after year. And their confidence and talent is amazing." This is the 9th year the Caps and the non-profit have teamed up. And it's always a good time. Rasha Abulohom was there with her 19 year old brother Mohammed. She was overcome at one point watching him have so much fun. "It melted my heart," said Rasha. "Honestly this is the best thing. I didn't know he would sit and go through this the whole time. It was awesome." 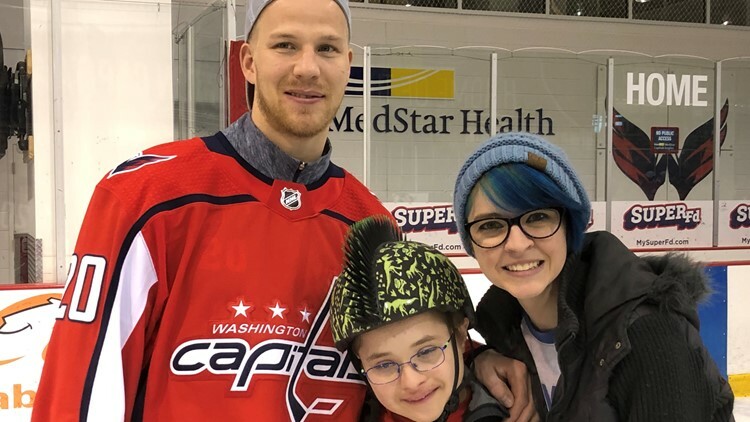 Mohammed got a picture taken with Capitals Forward Nick Dowd who said the event is special and that, "it means a lot to give back." Teammate Lars Eller said "It's nice just to make this day a little bit better for them." For some, it may have been the best day of their young lives.